No wonder the house is over-run with dolls. As I put this page together, I look around and see all the dolls in the display cabinets. Here are some. 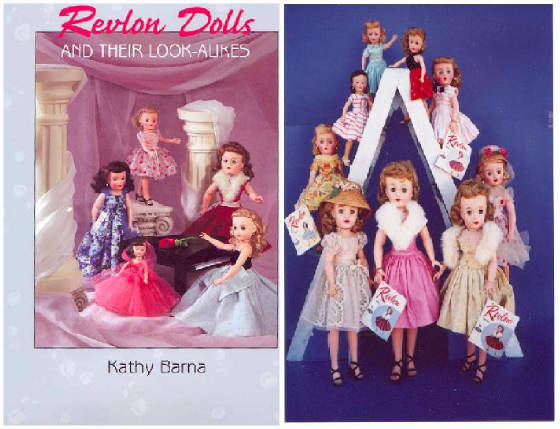 Kathy Barna has self-published a book containing many pictures of her fabulous Revlon and Revlon knock-off dolls. To see them for yourselves, as well as some my private collection of Deluxe Reading dolls, click on the link to order your own copy. Prices at this time are $35 plus shipping. This is my bent elbow Revlon. I love her dark hair. I want one with bent knees too, but it's probably like the largest Revlon, they're really not easy to find. My 22" Revlon came in with a ribbon and a rose, and nothing else. I had a Fashion Parade dress on her, and finally decided she needed her own. 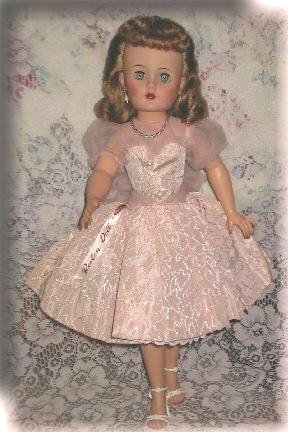 A couple of days in the sewing room made her a Southern Belle. 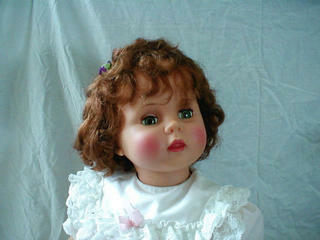 Shown below, is Kelly's minty 22 inch doll..doesn't she just take your breath away? OH, MY !! Gee, when I grow up, can I be a Revlon doll? 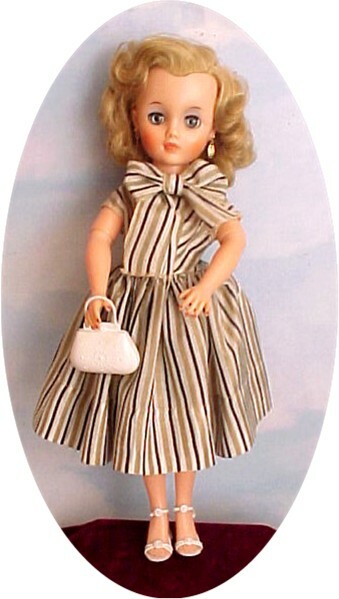 For shoes and accessories for the high heeled 10-20 inch dolls, check out Kelly's site for great hand fashioned supplies. 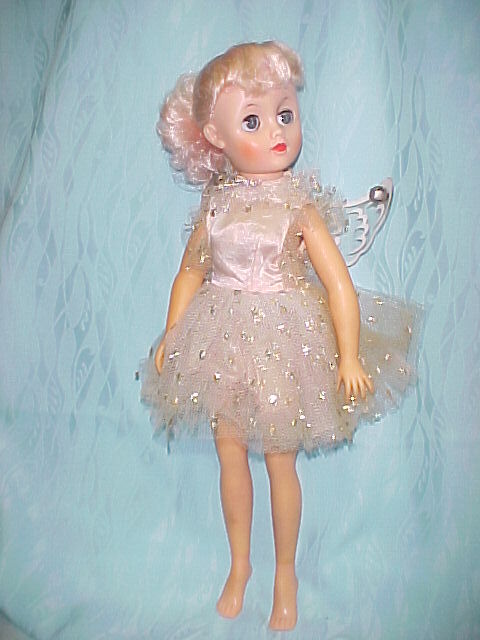 If you would like a reproduction tag, I have a picture that shows my doll's tag that I sell on ebay under bidding id sueandea. Check there for information on purchasing one. The pixie-faced Pink haired Fairy Princess. Suzanne Vlach had these pictures of her jointed elbow Revlons on ebay, and loaned it to me to show off. Look how lovely these smaller Revlon dolls are, and those rare elbows. 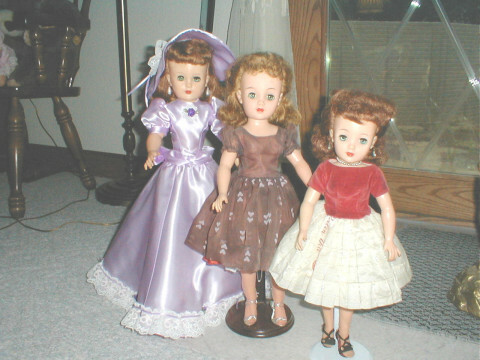 Now I have Horsman dolls, and they are not the same arm structure, so they were not switched and they definitely are not Cissy arms. 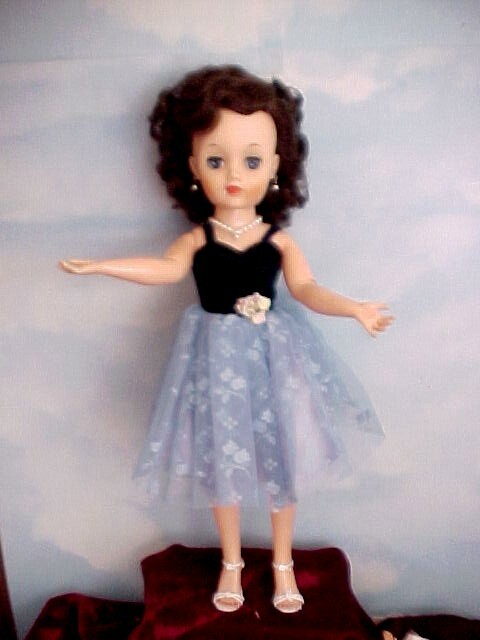 And Ramona Gray captured another one for her collection, click on the doll in blue for a peek at Ramona's beauty. 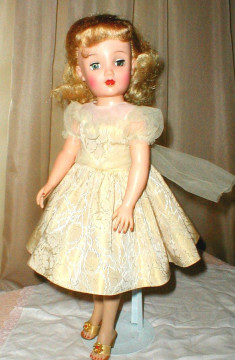 Here is my original Revlon Doll that I received in 57 or 58. She has a fur stole, but I have to store it, since it is made of real fur. My cat goes after it! She sat on my chest for years, and when I left home, she sat on my Mom's chest in her bedroom. She saved the box, but had laminated it to preserve it. Ruined, but still saved. 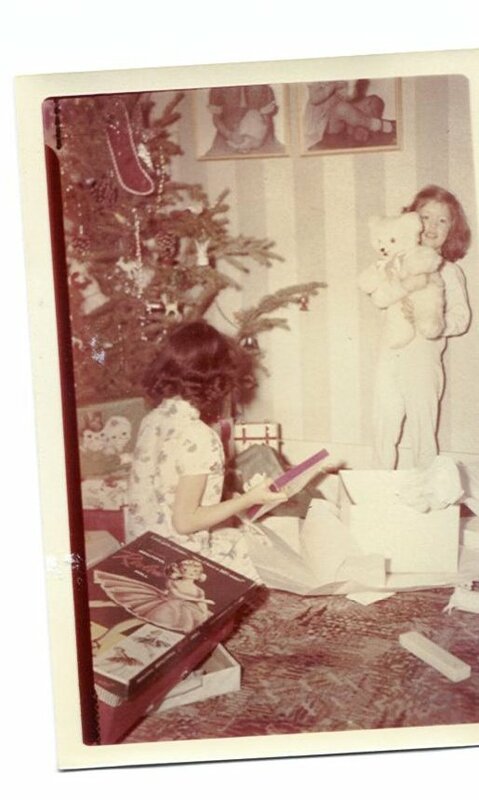 I had purchased two additional pair of shoes for her at the dime store, 59 cents, and they were still in the box. Shown below is a mib doll that showed up on an Ebay auction. 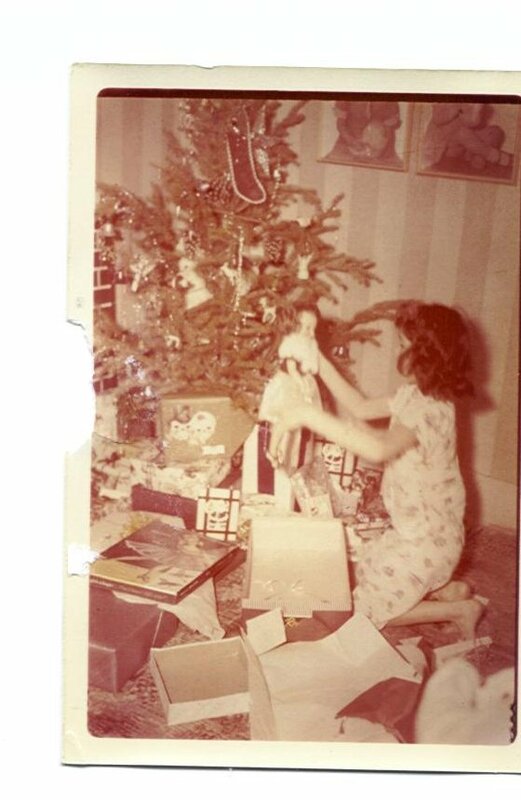 I knew that she had always had her hair pulled back into a bun...that was verified with this doll below, I knew she had the earrings, I forgot about the necklace, and the ring never registered...Funny what things are forgotten. And my girl...she lost one earring, I replaced it from a single 22 inch doll, and then she lost her other original earring...here I am back to trying to find her a matching set. I'm going to GLUE those rascals in. REALLY Reve. I really wanted a blonde Revlon. 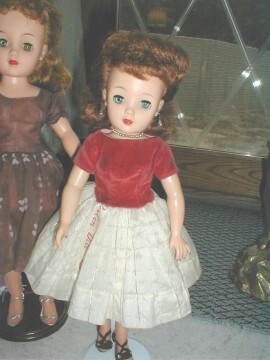 I finally got her, and her dress came in on a Horsman doll. After convincing the Horsman Cindy I would get her an authenitic dress for her, she gave up her tagged Revlon dress.. Click on her for a picture of her beautiful face. I picked this one in red up at a flea market. The owner said she tried to sell her on ebay, but she didn't go. 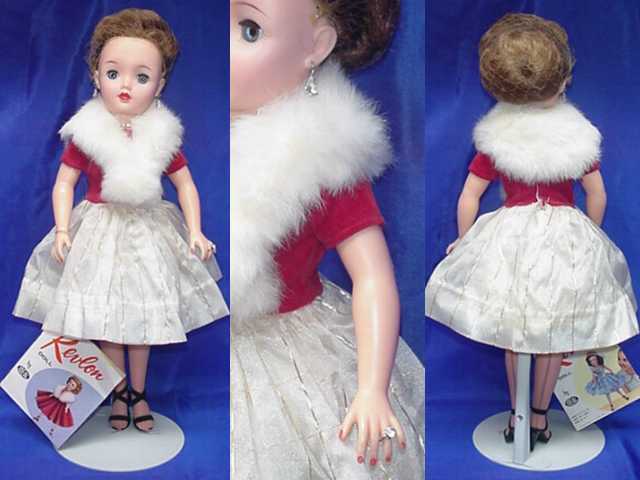 The doll has a saggy chin, The dress was great and cleaned up nicely. She has a fur hand muff and fur hat, but again, the cat keeps those off the dolls.